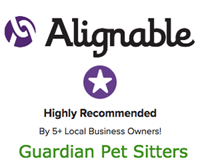 Are you a new client to Guardian Pet Sitters®? Please click here. If you are requesting service within the next 48 hours, please call 972-625-5272. IMPORTANT REMINDER: Once you submit your reservation, you will see a “Thank You” page. If you do not receive a “Thank You” page, please scroll down to ensure that there are no errors on the form. A reservation is NOT completed until you receive a confirmation phone call from a Guardian Pet Sitters® employee.